What better way to open a new orchestral season than with a sunrise? The elemental drone and brassy rays of light that begin Richard Strauss’s Also sprach Zarathustra – famous for its use in Stanley Kubrick’s 2001: A Space Odyssey – raised the curtain on David Robertson’s final season as Chief Conductor and Artistic Director of the Sydney Symphony Orchestra. It’s a season with a number of ‘event’ concerts, and Robertson kicked it off in style. Strauss based his 1896 tone poem on Friedrich Nietzsche’s philosophical work of the same name, though with an eye more to its imagery than a serious consideration of its philosophical implications. Robertson drew stunning sweeps from the SSO’s strings in the opening Sunrise section, building the percussion to a roar before the lingering sound of the Sydney Opera House’s organ – played by David Drury – added a liturgical hue to a work that depicts the tensions between nature and humanity. The strings were sumptuous throughout, but a particular highlight was Of Science’s tenebrous fugue that starts in the double basses and creeps up the orchestra – the port wine sound of Todd Gibson-Cornish’s bassoon reflected later in Umberto Clerici’s solo cello lines – before blossoming into the Viennese waltz of the Dance. While some of the wind entries in the final, inconclusive Night Wanderer’s Song weren’t quite pristine, the effect was nonetheless mysterious and luminous. Nigel Westlake’s Spirit of the Wild oboe concerto has a similarly elemental power, particularly in the hands of the SSO’s Principal Oboe Diana Doherty, who premiered the work with Robertson and the orchestra in 2017 – and has now also recorded it with the composer on the podium. 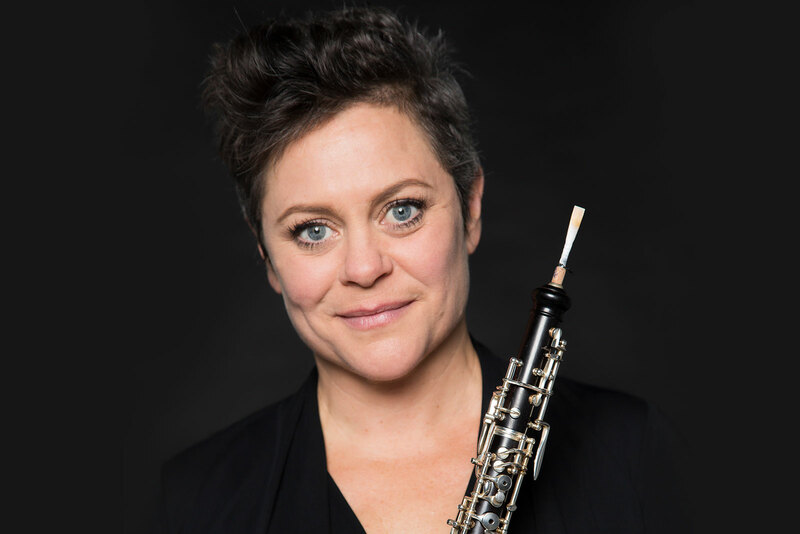 When Doherty toured Ross Edwards’ oboe concerto – Bird Spirit Dreaming – The New York Times dubbed her ‘The Dancing Oboist’ and she brought that same physicality to Westlake’s concerto, which was inspired by the rugged beauty of the Tasmanian wilderness. Sustained oboe phrases culminated in bird-like flourishes over restless strings in the opening, giving way to detailed, virtuosic lines – beautifully contoured by Doherty – with glittering percussion ricocheting off the soloist, the well-balanced orchestra consisting of a small string section plus harp, piano, horns and percussion. Doherty gave a stunning performance, even more organic and fluid than the premiere two years ago, dispatching florid lines and smouldering multiphonics with rockstar panache, dancing with the music’s driving syncopations. With no interval, the concert required a few stage resets, with a particularly elaborate change for the final work on the program. Percy Grainger’s 1917 The Warriors, music written for an imaginary ballet (Grainger hoping for a spot on Diaghilev’s Ballets Russes), brought a different kind of wildness to the Concert Hall, with huge forces – including three pianos – filling the stage. A festival piece if ever there was one, The Warriors is a large-scale piece by a composer who worked almost exclusively in miniatures, and while he denied a specific program, his notes imagine “Greek heroes with fluttering horse-haired helms; shining black Zulus, their perfect limbs lit with fire-red blossoms; flaxen-haired Vikings…” – and it goes on like that. The music itself is joyous – a kind of musical parade of delighted fantasy and boisterous Exoticism – and Robertson brought out its pleasures, giving a refined patina to a score that could easily become brash. You can feel Grainger experimenting in this piece – stretching the muscles of the large forces and working with the space in which they perform – and there’s a vibrant physicality to it. Brass fanfares filtered into the hall from behind the audience – a counterpoint to the darker, mysterious music on stage – in a compelling spatial effect, while Grainger’s trade-mark gamelan-inspired textures were rendered by a vast percussion section, harps and pianos, which (as per the composer’s score instructions) were played by “exceptionally strong, vigorous players”. The Warriors was a jubilant finale to a season opener that promises plenty more excitement to come. An excellent, fleet-footed performance from Diana Doherty, Jessica Cottis and the orchestra.